The art of good manners is the art of making others comfortable, smoothing over bumpy patches and considering the convenience of others. This applies to people, and it also applies to cars. As BMW prides itself on being “the ultimate driving experience”, it is no surprise that the cars in its benchmark 5 series are excellent examples of good breeding. Cars like the BMW 540i have very good on-road manners. The good manners of the BMW 540i begin with its behaviour on the road. The suspension, complete with traction control and stability control, helps the driver negotiate undulating roads and tight corners with ease and perfect safety. Active speed sensitive steering also helps the BMW 540i respond willingly and eagerly to the driver’s wishes. However, the good manners of the BMW 540i do not mean that it is a mild-mannered pushover. The 4.0 litre V8 engine can unleash and impressive 225 kW of power at 6300 rpm and a commanding 390 Nm at 3500. This torque and power means that the BMW 540i will be able to overtake slower vehicles quickly and conveniently. While speeding is not only impolite but also illegal, if you are able to find somewhere that you can test the BMW 540i out to the full, it can treat you to the pleasure of flying at a top speed of 250 km/hr. Other driving pleasures offered by the BMW 540i is the fun of accelerating up to 100 km/hr from a standstill, although this is a very brief pleasure, lasting 6.3 seconds. 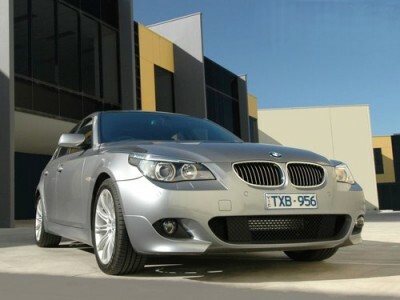 But the BMW 540i will be quite happy to oblige you by repeating the performance as often as you wish. Self control and grace in an emergency situation are other hallmarks of good manners, and once again, the BMW 540i shows its impeccably good breeding. The power and speed of the BMW 540i are easily checked by the ABS brakes with dynamic brace control. And should a crash occur, the BMW 540i is well equipped with head airbags front and rear, side airbags front and rear, and driver and passenger front airbags with an occupant sensor to prevent the airbags from rudely deploying when nobody is in the passenger seat. And as for the art of making people comfortable, the BMW 540i is a success. The seats in the cabin are very comfortable, with electric seat adjustment with memory function for the driver’s seat and electric lumbar support for the driver and front passenger. Those in the rear are also provided for with three point seatbelts and headrests. The BMW 540i also offers the options of having heated seats front and/or back – an option I would certainly say “yes, please” to. The BMW 540i also caters to the convenience of the driver with a helpful control display with an 8.8″colour monitor Professional Navigation system with a TV function and voice recognition, while it also entertains and informs via the 10-speaker radio/CD player. The interior is tastefully decorated with Dakota leather and high gloss wood trim in maple anthracite, brown poplar or light poplar. To look at, the BMW 540i couples modesty with crisp, sleek styling. The lines are powerful and smooth but not in an ostentatious manner. A delightful and charming aspect of the exterior looks are the headlights, which seem to have a human expression of focus and determination – complete with eyebrows. The design of the headlights is not merely frivolous, as the BMW 540i is equipped with bi-Xenon adaptive headlights with high beam assist and an automatic headlight control linking up with the rain sensor. For any more information on the BMW 540i, or for that matter any other new car, contact one of our friendly consultants on 1300 303 181. If you’d like some fleet discount pricing (yes even for private buyers! ), we can submit vehicle quotes requests out to our national network of BMW dealers and come back with pricing within 24 hours. Private Fleet – car buying made easy!